Mumbai, 10th May, 2017: Videocon d2h, India’s fastest growing DTH player has partnered with Dance with Madhuri to launch an interactive dance service called ‘d2h Nachle’. The service launched today in Mumbai, is set to win the hearts of dance lovers across the 18 million strong Videocon d2h subscriber base. d2h Nachle is available on Ch No. 525 and is available for free preview till 22nd May 2017. 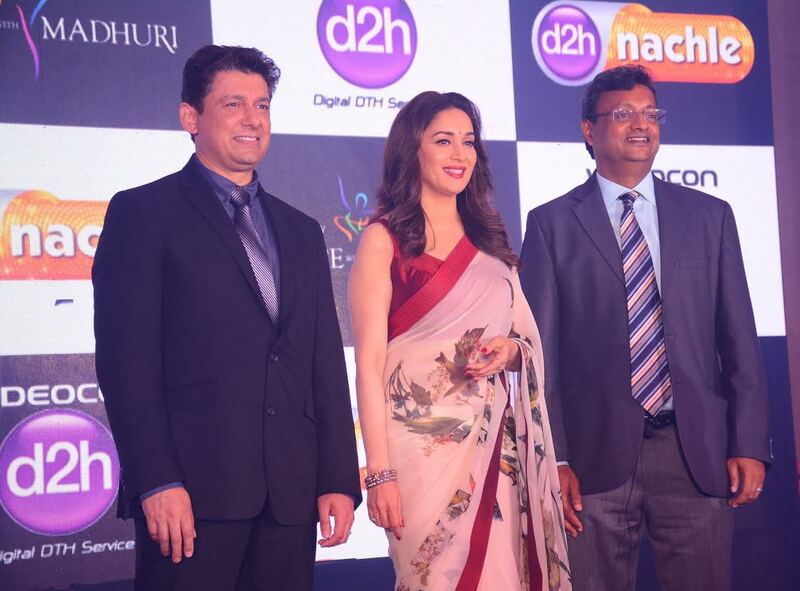 Madhuri Dixit, renowned for her legendary dance moves along with her Dance with Madhuri team of eminent gurus and choreographers, is all set to get you dancing on Videocon with its d2h subscribers. This association will give dance enthusiasts a chance to synchronise their steps and learn the best in class, dance lessons from the comfort of their living rooms. With support from gurus like Pt. Birju Maharaj, Saroj Khan, Terence Lewis, Remo D’Souza and a host of renowned choreographers from the industry, D2h Nachle powered by Dance with Madhuri is sure to charm subscribers. There are now over 100+ classes, 100+ hours of content and 1800+ lessons. From Indian Classical dance forms like Kathak, Bharatnatyam, to Western forms like Jazz, Contemporary, Hip Hop, Salsa, Bachata and of course lots of Bollywood, d2h Nachle powered by Dance with Madhuri is sure to be a dancer’s delight! Videocon d2h has prided itself in presenting its subscribers with a robust line-up of more than 650 channels and services, including a host of regional channels. It offers a wide range of active services like smart services including Smart English, Smart Games. The other active services include d2h Hollywood HD, d2h music, d2h spice, d2h cinema in both Standard Definition and HD, etc.